For sources other than Mobile (e.g Twilio, Facebook etc.) you should also enable the Conversation Sources feature. Contact your LivePerson representative in order to enable the features. In addition, an authentication server should be configured on the LiveEngage account. Refer to the Authentication Guide - Configuration section in the Developer Community for further instructions. Login to your account and go to campaigns → data sources → conversation sources tab. In order to utilize the Monitoring API, you will need, among other parameters, an AppInstallationId. In order to do so, you will first need to create an application, either by using the LE UI to create a Mobile App or by developing your own Private App. Click on Mobile App -> Connect and fill in the details of your application. 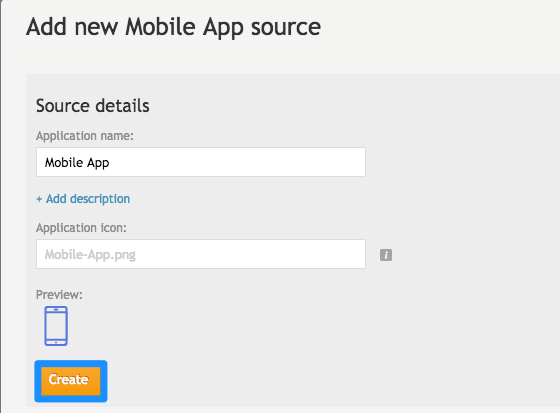 Click on create and copy the generated app key (AKA AppInstallationId). Please contact your Account Team to create a Private App and retrieve your AppInstallationId. You can now create an engagement with the Mobile App or Private App source. Before calling the Monitoring API, you will need to fetch the Monitoring API domain, which is the domain for the "smt" service. Please refer to this document for instructions on how to retrieve the "smt" service domain (aka 'baseURI').